Heading to Tennessee soon? There is always so much to do and see in the great state of Tennessee. 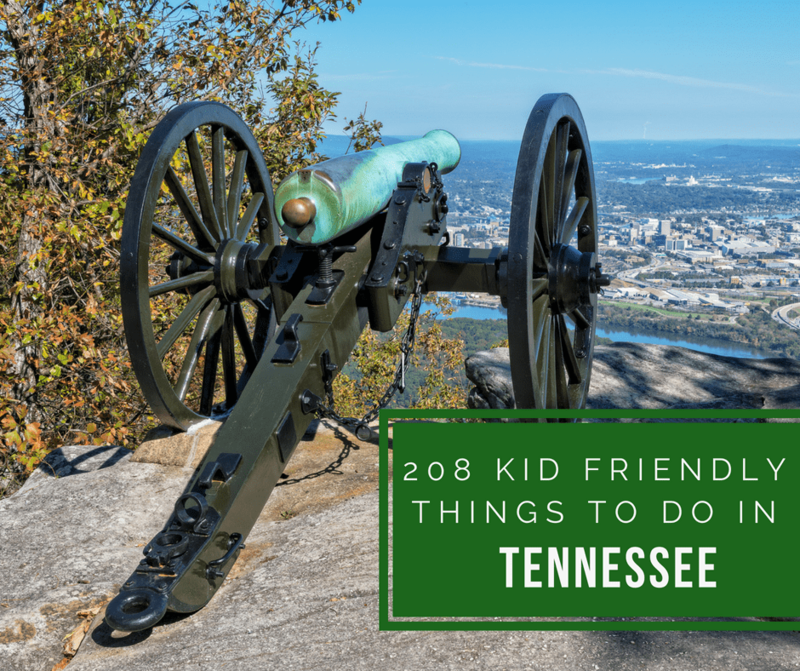 If you’re visiting with your kids in Tennessee, you’ll want to have a few kid friendly things to see and do up your sleeve. Out of all the states you can visit with kids, Tennessee really has a wide selection of activities to choose from. Don’t fret about what to do in Tennessee, you will have a list of kid friendly things to see and do with this article. 208 things to do with kids in TN! Dixie Stampede – If you’ve never gone, you’re in for a treat. Dolly has put a lot of hard work into making this a great attraction for families. Belmont Mansion – A little bit of Tennessee history is coming your way with this awesome historical mansion in Tennessee. Big Ridge State Park – Not sure of what to do in Tennessee? Visiting state parks is always a good idea. Make sure you check this one out when you’re visiting Tennessee with the family. Opryland Hotel – Take a walk in an amazing hotel and see all that the Opryland Hotel has to offer. A historical hotel that’s full of plenty to see and do. Eat, shop, and explore. The Johnny Cash Museum – Johnny Cash has given country music a lot of history. Take the kids to see his museum. Dollywood – Looking for entertainment for the whole family? Make sure you visit Dollywood! Plenty of rides and attractions for the whole family. Rock City – Have you ever visited Rock City? If not, you’ll want to make the visit while in Tennessee. Cades Cove – Full of natural beauty and plenty of history, you need to take the drive up the Smoky Mountains and into Cades Cove. Memphis Zoo – A trip to the zoo is sometimes exactly what to do in Tennessee or any state for that matter.. Make a trip to the Memphis Zoo and have fun exploring with the family. Children’s Museum of Memphis – Make a day trip of it and visit the Children’s Museum of Memphis. General Jackson Showboat – A show like you’ve never seen. Come aboard the General Jackson Showboat and have an amusing time. The Hermitage – Andrew Jackson’s home as so much history. The whole family needs to take a trip here to take it all in. Learning has never been so much fun. Graceland – Make your way out to Graceland, you will learn so much about the late Elvis Presley. Everything Gatlinburg – Gatlinburg is its own special little place. Lots of shopping and exploring to accompany your trip to this special city. Smoky Mountains – You can make a whole vacation out of the Smoky Mountains. Hours of hiking, driving, and exploring await you. Nashville Zoo – Another great zoo to visit while in Nashville is the Nashville Zoo. You’re going to love it. Parthenon – See a real life replica of the Parthenon, right in Tennessee! Dollywood’s Splash Country – It can get warm in Tennessee, you may want to make a trip to Splash Country to cool off. There are over 189 Free Things to do in Tennessee all of which are perfect for kids to do and won’t break your budget! Danielle Leonard is a gypsy soul, blogger, bookworm & mom to 5 kids. In 2015 her family sold everything & moved into an RV to travel full time. You can follow her travels at Our Roaming Hearts. What a great roundup! I have never been to Tennessee,, but would love to! Thanks for sharing with SYC. My kids are grown, but I would love these too! Came by from the Home Matters link party at Life with Lorelai. We had such a great time exploring the Opryland hotel. My kids thought I was nuts when I suggested we go hang out there for the afternoon.. then they were begging to back the next day. We also enjoyed the Parthenon; being huge Percy Jackson fans that was a “must see.” So many other great ideas here. Pinned. Wow what a list! Makes me wanna come back and visit Tennessee again!